The Labour Party annual conference takes place every Autumn and is one of the largest and most high profile political events in Europe. This year’s conference took place in Brighton with over 11,000 people attending and over 400 fringe events. On Tuesday 26th September, Show Racism the Red Card (SRtRC) hosted a fringe event at The Grand Hotel, Brighton. The SRtRC fringe event ‘Racism on the rise, Education Is the answer’ included some fantastic guest speakers. 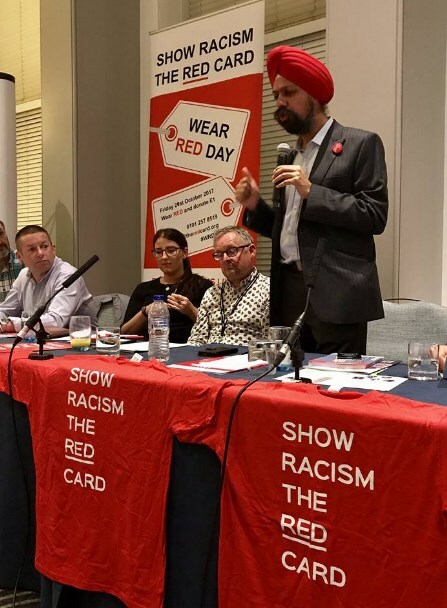 Kevin Courtney, the joint general secretary of the National Education Union, stated his support for the campaign and went on to say that he backs Show Racism the Red Card’s call to have anti-racism education on the national curriculum. Also speaking at the fringe event was Tanmanjeet Dhesi MP, who is the Labour MP for Slough. Tanmanjeet highlighted that this was his first speaking at a SRtRC event and the campaign had his full support. He also went on to praise Unite the Union for supporting the fringe event and for all the great work they do. Laura Pidcock, MP for North West Durham and former SRtRC Education Manager, expressed her delight to be able to speak at the fringe event for the charity that means a great deal to her. Laura also went on to say that the two organisations she holds close to her heart are Show Racism the Red Card and Unite the Union, who were both directly involved in the fringe event. Professional Footballer for Brighton & Hove Albion FC (BHAFC), Liam Rosenior, took the time out of his day to come along to the fringe event and speak in support for Show Racism the Red Card. Liam had also taken part in an interview with Show Racism the Red Card that morning at BHAFC’s training ground for the new SRtRC educational film. Liam spoke about immigration and shared with the audience that his family are from all over the world and he only believes in one race and that is the human race. Liam also spoke about being six year’s old and seeing the racism that his Dad received while playing for West Ham United FC and how that had impacted his life. James Mitchell who is a member of Unite the Union and works for the London bus service also spoke at SRtRC fringe event. James went on to state his support for the campaign and he spoke about how he was going to push Wear Red Day within his work and other Unite the Union branches. Howard Beckett, Unite the Union’s assistant general secretary, spoke last about how he has supported the campaign for many years and he went on to state that Show Racism the Red Card must be the trade unions response to the rise in racism in the United Kingdom. Show Racism the Red Card would like to thank Unite the Union for all their continued support for the campaign and for supporting the fringe event. A massive thank you to all the speakers who took time out of their busy conference schedules to speak in support of Show Racism the Red Card.